Once Twitter exploded on the scene, coders and programers all over the world started coming up with Twitter clients to satisfy the needs of the Twitter obsessed. With many paid and free options, you are now able to find a Twitter client that manages your social media needs down to a T. One of the newer clients to hit the market is MarketMeTweet. 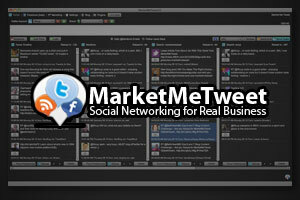 Every Twitter and Facebook client has its own set of features, so let’s take a look at MarketMeTweet’s. While this is not a comprehensive list of features, these are the highlights before we move forward. MarketMeTweet is very unique when it comes to Twitter and Facebook. While it does what you would expect out of any desktop client (posting Tweets/Facebook updates, multiple timelines, scheduling Tweets), there are several features of MarketMeTweet that really set it apart from the other free and paid clients on the web, so let’s take a look at those individually. MarketMeTweet has a really cool feature built into the application that allows you to create your own Twitter application. Now what does this do for you…the blogger or business owner? It allows you to create an application within Twitter that changes your byline to include “via Robb Sutton” or anything you choose below your tweets. That “Robb Sutton” is also linked to RobbSutton.com so anytime it shows up in the timeline of one of my thousands of Twitter followers, it is clickable right back to my homepage as you can see below. What does it do for your business or blog? Well…for those Twitter followers that use the web client for Twitter, you are no longer promoting your Twitter client. You are now promoting your own personal brand which carries a lot of weight online. When MarketMeTweet first hit the market, this was the #1 feature I was most interested in as I like to keep branding as secure and consistent as possible, and it works flawlessly, I can also implement the placementseo tactics at the same time. One of the other really cool features within MarketMeTweet is the ability to auto reply to your followers based on keyword selection. Now…before you start thinking, “wow…that is spammy” let me explain just a little bit. Yes, if you are planning on setting up just a couple of lines of reply and hitting up as many keywords as you can and then leave it alone without paying any attention to it later, you are going to be a spammer. On my end, I do not have time to go through my Twitter timeline for hours on end a day, so this allows me to start conversations with other Twitter users based on information I want to talk about. It is not a set it and forget it system…you still have to interact after the fact if you really want to see results. 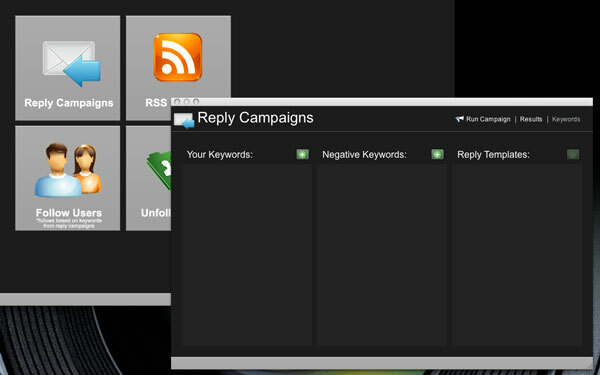 As you can see by the screenshot, you can also create “negative keywords” to better filter your results. These days, I do not use too many (ok…none) auto follow services. Don’t get me wrong…I have used them in the past and they have helped me find new Twitter users that are looking for the information I provide. I just don’t have the time to manage applications like that for the return it brings me at this point in time. With MarketMeTweet you can use that same keyword strings that you created to handle your auto replies to auto follow to auto follow Twitter users that are talking about subjects you want to connect with. Unlike other auto follow scripts, the MarketMeTweet version is pretty light so it stays underneath the radar while you grow your Twitter following. It also does it via the keywords I have already set up and in the background so I am able to just hit a switch without too much time management on the backend. 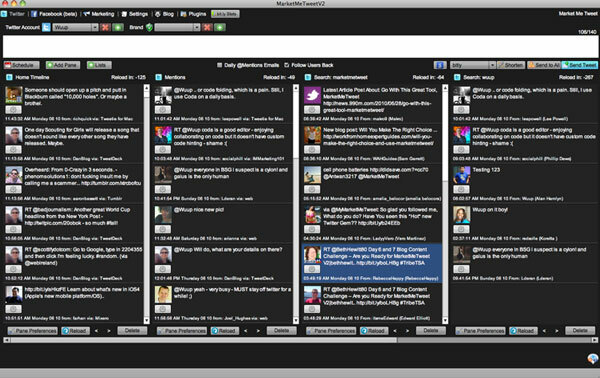 Overall, the MarketMeTweet desktop client for Twitter and Facebook is a strong application. With a user friendly, easy on the eyes interface and Adobe Air integration (makes for easy update and launching), MarketMeTweet answers all of the Twitter and Facebook needs you should have for your blog or business. With unique features that are very focused and provide real results, MarketMeTweet justifies it’s paid status as a Twitter and Facebook desktop client. Is it perfect? Not completely. MarketMeTweet does its unique features incredibly well, but there are a couple of little usability options I would like to see included into newer versions. I would also to be able to setup panes on an account basis so I can see multiple accounts at once on one screen. Right now…you have to switch accounts through a drop down menu to see the different timelines, replies and search queries. If MarketMeTweet really want to rock it out, an iPhone app would completely make my day as most of my Tweeting is done on the road and the branding element would be great on my iPhone (you can schedule Tweets on the road through the Google Calendar integration). Branding – HUGE! The ability to brand your Tweets is unique and strengthens your brand. With pricing plans starting at 15 bucks with strong support and a 30 day money back guarantee, MarketMeTweet is the answer for blog and business owners looking to expand their business and stay on top of the trending topics on Twitter. If you are looking for a Twitter and Facebook client that will meet the needs of your business or blog, MarketMeTweet is your answer. If you want to see more:Click here to check out MarketMeTweet. As an FYI, I actually bought a copy of MarketMeTweet, this was not a freebie for review. I was just reading up on this product the other day and will give it a go. The original version had some issue with my host (HG) and would not run properly. Tammy over at MarketMeTweet and I could never quite figure that out, but that was about a year ago. I love the fact that you can control your branding, which is what makes this worth having in the toolkit. Every bit of real estate we can claim is helpful. 😉 The additional features are also attractive, making this quite a nice client. I actually checked out the video on this a couple of weeks back, but hesitated. Now I know someone, personally, that has used it, I am probably gonna give it a go. The branding aspect for me is MASSIVE. Hi Robb, Great Review. But could you add that Post To All works absolutely fine now? Fan Pages, Personal profile, even using ping.fm! The update to all works great for Twitter, Facebook and ping.fm. Added as a Positive feature. Thanks for the heads up.